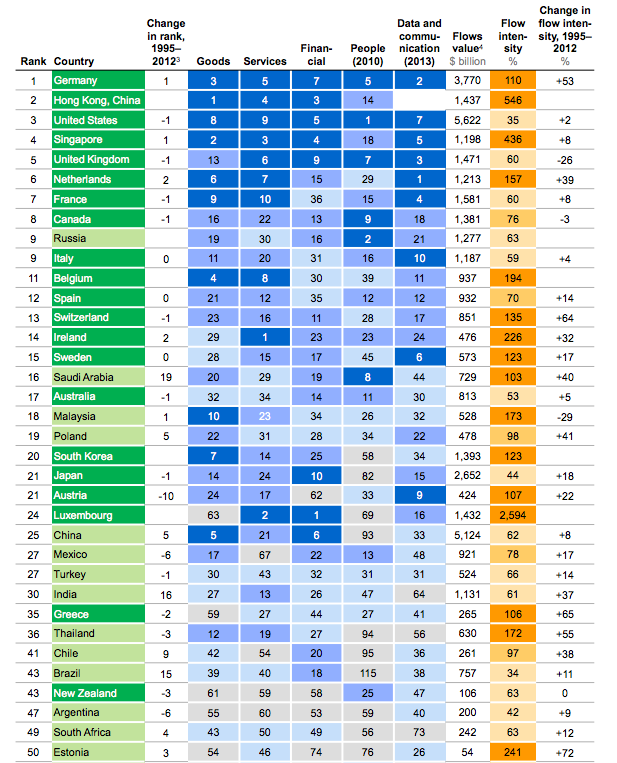 McKinsey Global Institute Global Connectedness Index was published in April this year, scoring countries connectedness index and overall flows based on data through 2012. Rank of participation by flow as measured by flow intensity and share of world total. Couple of things to notice: Ireland's position is strong at 14th rank, but it is not as strong as one would have expected. And certainly would not be anywhere near the 14th rank were we to consider Ireland's indigenous enterprises, as opposed to MNCs. Another point: Ireland's strengths are in only one segment: services flows. Which are, of course, skewed very heavily by a handful of MNCs trading out of ICT services and IFSC. In fact, we rank below Russia in Data and Communications flows, despite being a global hub for ICT services MNCs. Scarier bit: we rank below virtually all our direct competitors in the global markets. Robert Merton at MIT has been working in this area too (it was Merton's foray into the application of 'big data' for financial purposes). His logic I think, was that fund managers cannot be expected to have 'resources' to watch all aspects of the markets, but by studying particular areas - where the data might throw up something in the analysis - that may warrant further concentrated work and study. B.